Wiktionary defines ersatz as "made in imitation; artificial, especially of an inferior quality." Usable as an adjective or noun, ersatz is a German loanword to the English language. For example, Mickey Mouse is an ersatz of Oswald the Lucky Rabbit because Walt Disney lost the rights to Oswald in the late 1920s and had to come up with a new character. Oswald himself is an ersatz Felix the Cat because, in the early days of animation, Felix was king. It is my educated guess that Felix the Cat is ultimately an ersatz of one or more trickster deities from tens of thousands of years ago, who plagued -- but also taught laughter to -- early humankind, before the merciful great-grandmother Wolf sent some of her children to take care of you hairless apes. Yes, I know, dogs are awesome. My ancestors probably gave you the secret of fire. And belly rubs. 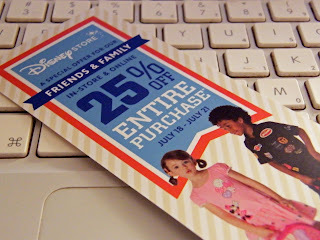 Since I've written myself into a corner, writing about ancient times, I might as well write SEGUE TO DISNEY STORE SALE. The Disney Store has a sale almost every week, so many of them aren't worth publicizing. This weekend, however, you'll save 25% on probably all of the merchandise at the Disney Store in your local mall and online at disneystore.com (we don't have an affiliate link for Disney), with the coupon code DISNEYPAL. The sale ends on Sunday the 21st. 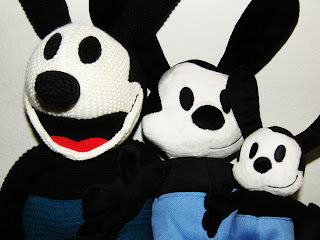 Oswald the Lucky Rabbit in Large, Medium, and Small. SEGUE BACK TO OSWALD THE LUCKY RABBIT. In 2006, the Walt Disney Company reacquired Oswald from Universal, in exchange for sports broadcaster Al Michaels. Since then, they've slowly reintroduced Walt's first animated superstar to the public. Well, in Japan, they've been Oswald-crazy for decades, so Japan's Disney store has tons of cool Oswald merchandise. In the States, at least, they've been slow to sell Oswald stuff, unlike the inexplicable ubiquity of Duffy the Disney Bear. Why is that teddy bear everywhere? 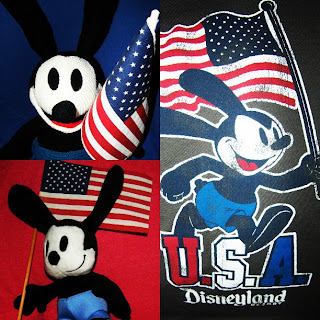 In any case, recently, there has been more Oswald merchandise, like t-shirts (a red one, a blue one, a flag one, and a women's one), souvenirs from Oswald's Filling Station at Disney California Adventure, and at least three kinds of plush toys. The large, crocheted $32 Oswald might still be available at Disney California Adventure. 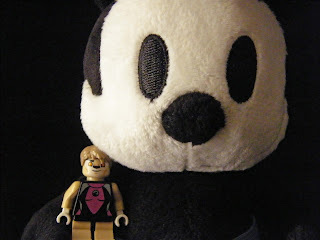 The small $10 Oswald is currently sold out at the Disney Store, but might return. The previously-sold out medium-sized $20 Oswald is available again at the Disney Store, in store and online. If you don't want to shop at Disney, you could also get price-gouged from various sellers at Amazon: small and medium -- the large, crocheted, California Adventure one, when available, is usually price-gouged approaching $100 on Amazon. The moral of the story: Use the 25% coupon / coupon code DISNEYPAL at the the Disney Store, if you want to buy some of this stuff. That's all for today; time for lunch! K8 the Lucky Minifig, an ersatz of Kate the Lucky Dog! It is one of my goals in life to be the dog version of Oprah. Around the time I was born (late April, 2011), Oprah broadcast the last episode of her talk show (May 25, 2011). Before that, during Christmastime, she would have a special episode called "Oprah's Favorite Things," in which advertisers would give her production a bunch of stuff to give to her ever-so-grateful audience. I'm not sure whether Oprah really liked these things, or if she was contractually obligated to make them her temporary favorites. In any case, I'd like to do that. I have a lot of favorite things, from minty, glow-in-the-dark balls to dog biscuits, and from Doctor Who-related timey-wimey merchandise to the timeless music of Queen. 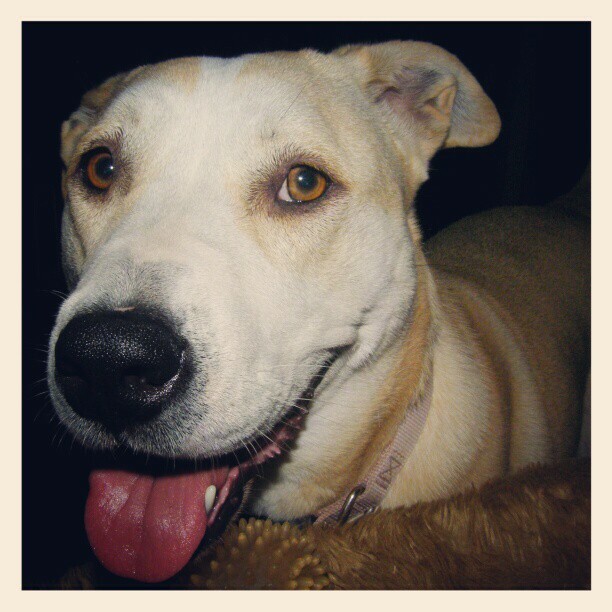 I would love to one day exclaim, "You get a Milk-Bone! You get a Milk-Bone! 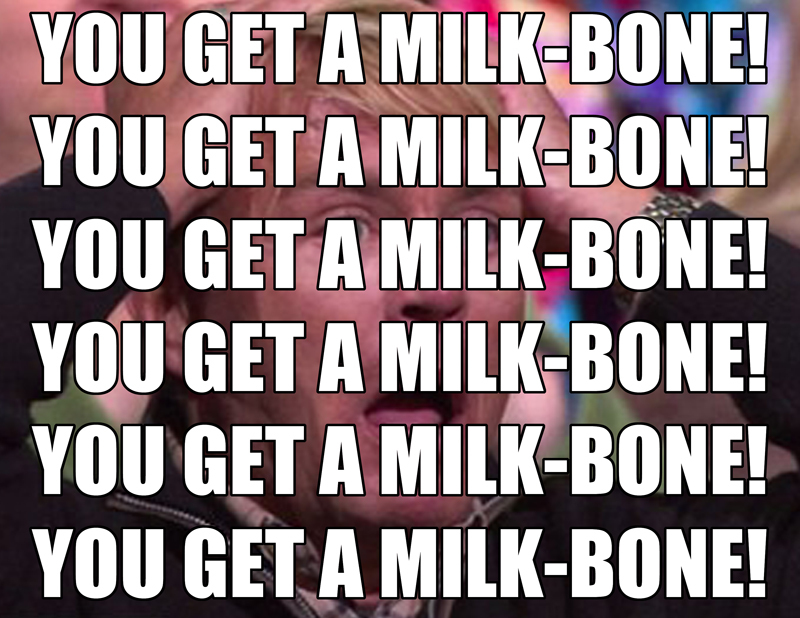 You get a Milk-Bone!" (or similar brand of dog biscuits) to a hysteric audience of canines and/or people who really dig dog treats. If you had these treats, you'd agree. Until that glorious era of super-stardom, however, I will have to make due with trying to sell you some of my favorite things. 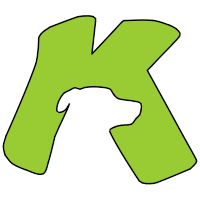 Whenever I post an affiliate link, you should see a little green 'K' icon with my silhouette, as so: . Depending on the retailer or service, Kate's Toys will receive a percentage of whatever you buy as commission. Using these affiliate links shouldn't -- knock on wood -- affect your shopping experience in any negative way. It would be great to earn some treat money, even though I get treats anyhow. You know, my business partners haven't told me where the proceeds will go. I'll have to discuss this at a meeting in the near future. To conclude, I hope to one day subtly sell people products by giving them away to a select, yet extremely enthusiastic, few. I hope to do so as charismatically as possible because, let's face it, when Doctor Oz plays the role of Holiday Elf, it's not the same. I like playing catch. I can leap high and grab just about any flying object with my mouth. If I don't catch something, I'm playing fetch. On purpose. Spiky, bouncy, floaty (if only I had a pool!) balls are among my favorite toys. 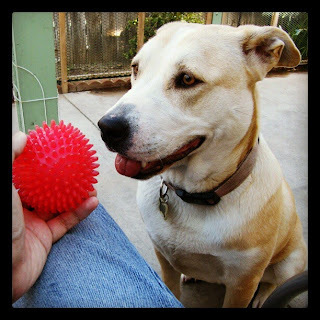 I've played with several spiky balls over the past 15+ dog years, or 2+ regular years: A pink one, a purple one, an orange one, a red one, a blue one, and a green one. I can chew with the best of 'em, which means that round balls will become flat things eventually. Flat balls are still good to catch, but they are no longer fun to play with when they start to break apart. The majority of the spiky balls came from Petco: The pink one, the purple one, the orange one, and the green one. The pink and purple balls are no longer with us (R.I.P. ), but they lasted for months of fun. The orange ball is somewhat flat, but still bouncing a bit after about a year and a half! The green one is the newest one -- I received it sometime in May -- and it's starting to get a bit flat. I still prefer playing catch with the orange ball most of the time. Two of the spiky balls were purchased from Target: The red one and the blue one. I received the red one around Valentine's Day, earlier this year. It lasted a few weeks before a chunk broke off of it. Tragically, its life was cut short! Speaking of Easter, you should check out this cartoon about the Easter Bunny, and how his dog disciple betrayed him in the Judas Iscariot sort of way, explaining why dogs can't (or shouldn't, depending on weight) eat chocolate. It's probably offensive to extremely devout Christians, or at least the ones who don't respond well to satire. It should really be offensive to dog-kind, but it isn't. Okay, maybe only the humorless ones. But I digress. The blue Easter ball lasted a couple of days, and it was game over. It was a sad day. At least I had my orange ball, as well as my other toys, to console me. As mentioned earlier, I received a green one in May, and it is currently with me to this day. This might not be true of all spiky balls from Petco and Target, but in my professional opinion, Petco's spiky balls last longer than Target's. Both stores sell these balls for about $5 each, and there's some likelihood that they're made in a similar, if not the same, factory in China (or thereabouts), but if you're in the market for a bouncy, spiky ball, go to Petco. 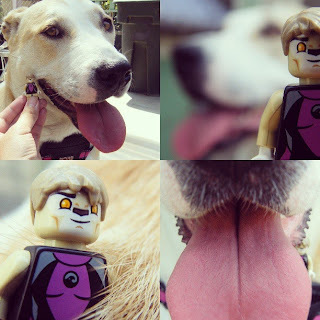 ARF! This site has been abandoned since February 2011. That was before I was born! Things are going to change, now that I'm in charge. My name is Kate, and I'm a dog. I like toys, licking things, chewing on things, and fetching things. And eating things, as long as they are tasty. I like jumping onto couches and laps. I love to play catch, fetch, and kvetch. I AM EXCITED ABOUT EVERYTHING! except ear drops. I loathe ear drops. We'll also write about dog stuff, like toys and treats and tasty things. I will give you my expertise on these subjects, telling you what I love, what I like, and what I don't like. 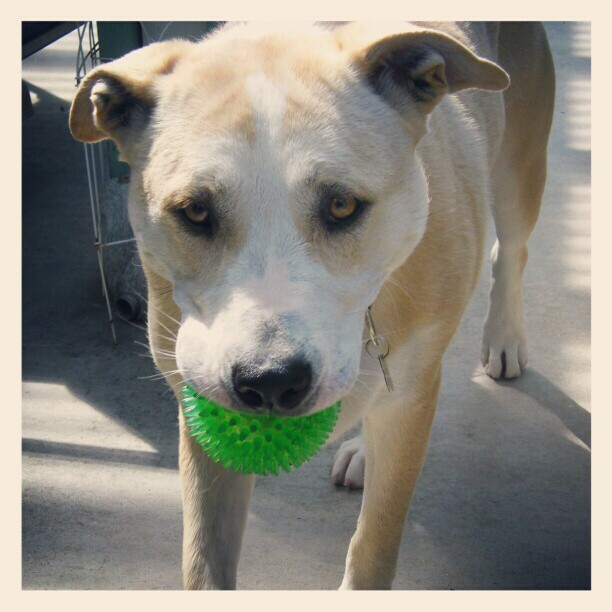 With over 15 dog years of experience, and counting, you can trust Kate -- that's me! A furry photo of yours truly will mark my seal of approval for these kinds of articles. Speaking of seals, aren't they really dog mermaids? I welcome you to the new Kate's Toys! P.S. I must quickly translate for my canine friends: Arf! Arf! Grrr... [pant] [pant] [pant] Ruff!